Is it possible to play high-resolution audio from a sound bar — and stream it throughout your home? Bluesound emphatically says “yes!” with their Pulse Soundbar. This compact sound bar fits easily under most TVs and delivers spacious, fully detailed sound from your movies and shows. And, as part of Bluesound's "ecosystem" of whole house streaming music players, it delivers top-notch sound from all your wireless music sources, including high-res files from a network-attached storage drive, internet music services, or even Bluetooth from your phone. You can build an impressive wireless surround sound system with the Pulse Soundbar. Just add a Bluesound Pulse Sub and two Pulse Flex speakers. The sound bar has Dolby Digital decoding built in. It wirelessly sends true Dolby rear-channel sound to the Pulse Flex speakers and low bass to the subwoofer. That puts you right in the middle of an enveloping home theater soundstage. 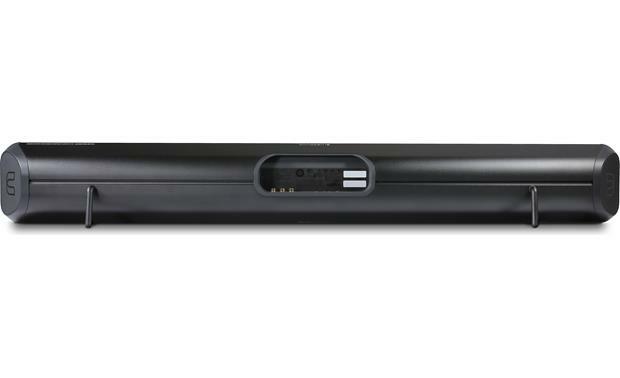 The Pulse Soundbar comes with a variety of listening modes for tailoring its sound. Two dialogue enhancing modes make it easier to understand what's going on. A wide cinema mode opens up the soundstage — great for epic blockbusters. There's also a wide music mode, so you can play a live concert Blu-ray and feel like you're in the audience. "The sound seemed to open up and breathe a little more with the higher-resolution MQA files (streaming on TIDAL MASTERS). Roberta Flack's 'Killing me Softly' was a highlight. The strong thump of the bass and percussion took over my rapidly nodding head at first. Then my movement was forced to slow down by Flack's beautiful "can't-be-rushed" vocals as the song went on. Her voice was crystal clear, and there was an extra spaciousness to the song." Bluesound is compatible with virtually all digital music formats — including high-resolution files up to 24-bit/192kHz. Access the music stored on your computer or a networked hard drive. Stream from internet radio stations and online services like Spotify®, TIDAL, and Deezer. You can also enjoy downloads from high-res music sites such as HDtracks. The player is compatible with MQA, an up-and-coming high-resolution audio format. The Pulse Soundbar also features a USB input for playing files "locally" from a thumb drive or hard drive — ideal when friends come over with their own music. The Pulse Soundbar features aptX® audio coding, an advanced form of Bluetooth that allows higher-fidelity sound with compatible Bluetooth devices. The system is backward-compatible with earlier forms of Bluetooth, too. Bluetooth is a convenient way to play the sound from any app you might be using on your mobile device, including Netflix® and YouTube®. You can even share that Bluetooth source with other Bluesound music players around your house that are connected to the same network. The Bluesound system is easily controlled from your smartphone or tablet. Just download the free app from the Apple® App Store or Google Play. The app lets you select songs and adjust volume. Choose to play music in one room, all rooms, or different tracks in different spaces around your home. Extremely easy to set up and integrate into the rest of our Bluesound system. Sounds amazing! Mounted to Bluesound TS100 combined TV/sound bar stand. 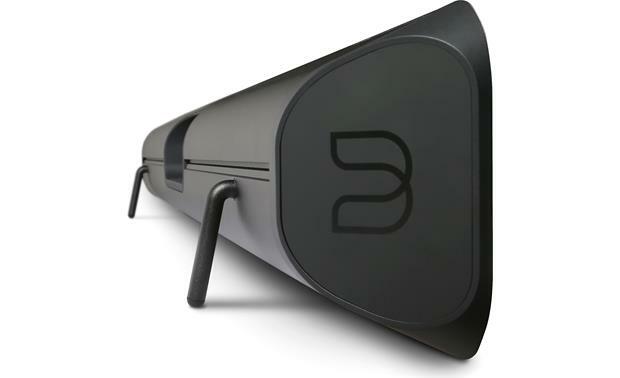 True 3-Way Speaker Configuration: The Bluesound Pulse Soundbar uses many high-end hi-fi techniques to achieve its unparalleled performance, including true 3-way speaker configuration with direct digital tri-amplification. This means that each driver has its own dedicated amplifier channel with a powerful DSP for the crossover filters. Each driver is custom developed for this application and includes individually optimized chambers for ideal speaker operation and isolation. Dual Passive Radiators: The Bluesound Pulse Soundbar speaker utilizes dual passive radiators for extended bass response that is rich, detailed, and full sounding. Extruded Aluminum Enclosure: The Pulse Soundbar's stylish black cabinet is constructed from extruded aluminum which is known for its unyielding rigidity and strength, while allowing the largest possible interior volume due to thin wall construction. Analog & Digital Audio Inputs (Dolby Digital Compatible): The Pulse Soundbar is outfitted with both analog and digital audio inputs. 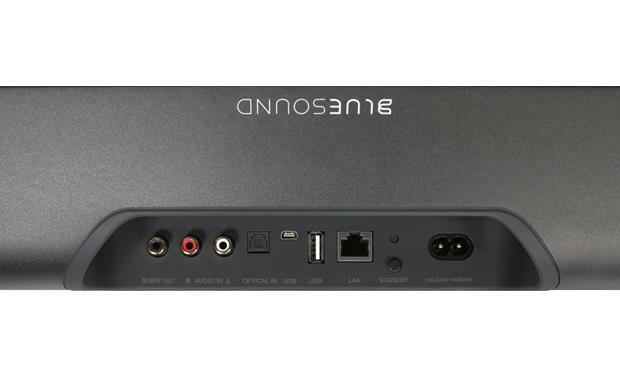 There is one optical (toslink) digital input to connect to your TV's optical output. The unit supports 2ch PCM & 5.1ch Dolby Digital audio (Dolby Digital will be down-mixed to 2ch). There is also a stereo RCA analog input for connecting an analog audio source. Audio Settings: The Pulse Soundbar offers a Dialogue Enhancement mode for clear movie dialogue, a Late Night Listening Mode for compressing the soundbar's dynamic range while watching movies late at night, plus Bass & Treble adjustment to fine tune the soundbar speaker's sound. USB Port: The Bluesound Pulse Soundbar features a USB (type-A) port to directly connect a USB mass storage class (MSC) device; such as a thumbdrive or external hard-drive. The unit's USB port supports music playback from these compatible USB devices formatted in FAT 32 or NTFS. Not only can USB audio be played back on the Pulse Soundbar, but can also be wirelessly distributed to the rest of your Bluesound components throughout your home for multiroom playback. Optional Powered Subwoofer: The Pulse Soundbar can be paired wirelessly to up to two optional powered subwoofers for greater bass extension. Thanks to the Pulse Soundbar's built-in wireless transmitter, you can wirelessly connect the Bluesound Pulse Sub (813BPSUB, sold separately) for bigger bass performance. In addition, Bluesound's RT100 Wireless Speaker Link (813RT100, sold separately) can be used to wirelessly connect almost any powered subwoofer with a line-level input to the Pulse Soundbar. The Pulse Soundbar also features a mono-RCA subwoofer output for adding practically any powered sub (sold separately) with a line-level input and built-in low-pass crossover. Optional Wireless Rear Speakers: Along with an optional powered subwoofer, you can use the Bluesound Pulse Flex, Pulse Mini, or Pulse 2 (all sold separately) as wireless surround speakers to create a 4.1ch home theater system. While the Pulse Soundbar will support Dolby Digital 5.1ch decoding, the audio is dowmixed to 4.1ch with the center channel information fed into both the front left and right channels. Mounting Options: Intended for use with flat-panel TV's 42" or greater, the Bluesound Pulse Soundbar can be simply placed on a shelf that is below or above your television. It can also be wall-mount below or above your TV using the included wall-mount bracket. Also available is the Bluesound TS100 tabletop stand (813TS100, sold separately) that lets you mount up to a 65" TV along with the Bluesound Pulse soundbar on top of your piece of AV furniture. Bluesound Wireless High-Resolution Audio Eco-System: The Pulse Soundbar speaker is part of Bluesound's wireless high-resolution audio eco-system. The Bluesound wireless high-resolution audio eco-system consists of music players, amplifiers, hard-drives, and wireless speakers to playback your high-res and low-res music files, along with your favorite online music services throughout your home using your home's WiFi network. With an advanced WiFi antenna design and blazing ARM Cortex9 Processors, Bluesound ensures a solid connection in every corner of your home. Play your music in perfect sync or play different music simultaneously to any Bluesound device in any room. 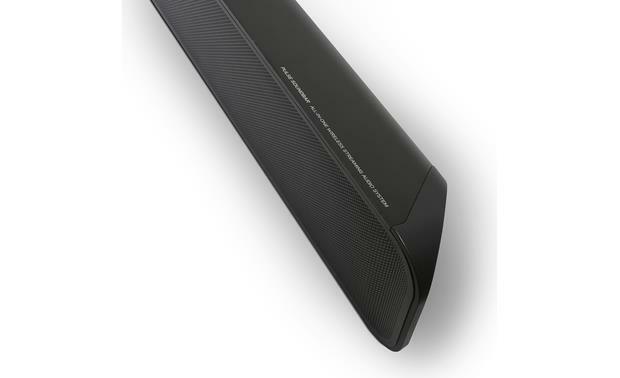 Wired or Wireless Network Connection: The Bluesound Pulse Soundbar can be connected to your home network and Internet provider via a hardwired Gigabit Ethernet (RJ-45) jack connector or wireless WiFi (802.11 b/g/n) connection. Either network/internet connection allows you to stream music from your Windows or Mac computer and NAS drive (such as the Bluesound Vault, sold separately); as well as stream select online music services. Bluesound Controller App: The free Bluesound Controller App turns your Apple iOS (7.0+) iPod/iPhone/iPad, Android (OS 4.0+) smartphone/tablet, Windows (Vista or higher) PC or Mac (O X 10.7+) computer into a full-featured remote control for the Bluesound wireless music system. The Bluesound Controller App on your compatible device uses your home's WiFi network to connect with Bluesound devices, so you can play all the music you love anywhere in your home for a wireless multiroom music experience. Get on-demand access to your music libraries on your home network, stream live Internet radio from almost any place in the world, or listen to one of the many music services available on Bluesound, all from the palm of your hand with the easy-to-use Bluesound Controller App. Online Music Services: With a network and internet connection, the Pulse Soundbar lets you access select online music services & internet radio. The Bluesound Controller app on your Apple iOS or Android device will serve as the controller for these apps and provide song/artist information with Album Art. 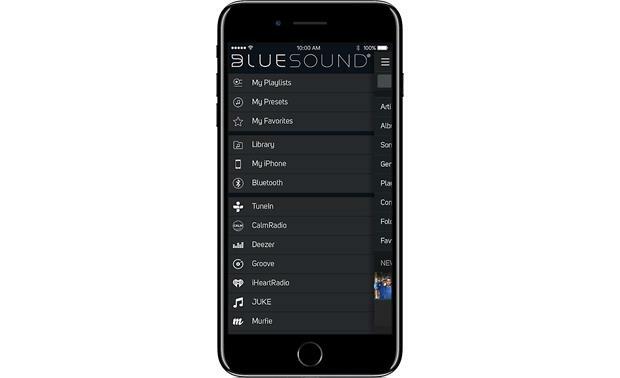 Mobile Device Music Library: From the Bluesound Controller App, you can stream music directly over WiFi from your Apple iOS or Android device to the Bluesound Pulse Soundbar and the rest of your Bluesound components around your home. The app gives you complete control of your compatible mobile device's music library with song/artist information and album art. Bluetooth w/ aptX: The Bluesound Pulse Soundbar features built-in Bluetooth 4.0 with support for wireless music streaming from your Bluetooth-enabled Apple iPod/iPhone/iPad, Android smartphone/tablet, Windows PC/Phone, Mac computer/laptop, and more. You'll be able to stream stored music and music apps on your Bluetooth-enabled device to the Pulse Soundbar. In addition, the Pulse Soundbar offers aptX for CD-quality sound from Android (OS 4.0+) devices. You can even distribute Bluetooth audio to the rest of your Bluesound wireless audio system throughout your home or office over WiFi.